IGNITION LEAD SET (7MM RESISTIVE) FOR OPEL SENATOR 3.0 1987-1993 VE522772. Part Number: VE522772 (Ref.Only). Model: Senator. Make: OPEL. Filters and Ignition. Product Type: IGNITION LEAD SET (7MM RESISTIVE). IGNITION LEAD SET (7MM RESISTIVE) FOR OPEL SENATOR 3.0 1987-1993 VE522454. Part Number: VE522454 (Ref.Only). Model: Senator. Make: OPEL. Filters and Ignition. Product Type: IGNITION LEAD SET (7MM RESISTIVE). OPEL 1612430, 1612476. GENERAL MOTORS 1612476, 90296017. OPEL SENATOR A (29_) 2.5 Saloon Petrol 05/1978 12/1980 RWD 12 115 85. OPEL SENATOR A (29_) 2.5 E Saloon Petrol 01/1983 08/1984 RWD 12 136 100. OPEL SENATOR A (29_) 2.5 E Saloon Petrol 09/1984 08/1987 RWD 12 140 103. Quote FP122. FORMULA POWER 10mm HIGH ENERGY RACE QUALITY HT LEADS. MONZA A, 6 Cylinder, 2.5, 2.8, 3.0 Ltr 78>86. A typical energy drop is an amazing 1-2% compared to standard cable of 15-18%. The Ultimate cable for spark efficiency for the Aston range. The device contains two copper wire windings and a laminated iron core. The copper wires are insulated to prevent short circuits. The battery current fed through the primary winding produces a magnetic field whose strength is further increased by the iron core. Engine Code: 20 N | Quantity: 1 | for electronic ignition (EI). Any information in the compatibility table is for reference only and there may be unspecified choice options. Labour claims & consequential loss claims are never accepted. Denso Spark Plug W20FP-U x 8. Lambda sensors. Vehicle compatibility data, where provided, shows suitable parts for a specific vehicle butdoes not confirm the quantity required. Spark plugs. Quantity: 8. A relay is an automatically electronic operated switch. We apologise in advance for any inconvenience caused. XUD9TF, XUD9BTF. A9A (XUD7). 7/79->6/82. 2.5 D, REFLEX. 4/83->12/92. M25-648(CRD93T), M25-669, M25-671. 2.5 TD TURBO 2. 7/82->12/92. Champion Spark Plug RL82YC x 2. Vehicle compatibility data, where provided, shows suitable parts for a specific vehicle butdoes not confirm the quantity required. Quantity: 2. Spark plugs. Glow plugs. KERR NELSON: OEF300, BERU: ZEF627, BREMI: 300/382, CHAMPION: CLS218, GENERAL MOTORS: 90296017, JANMOR: ODS234, ODS238, ODU234, ODU238, MOTAQUIP: LDRL1817, OPEL: 16 12 430, 16 12 476, QUINTON HAZELL: XC589, SMPE: 73782, OEK101, OES109, VALEO: 346662. Model SENATOR. Filters and Ignition. OPEL ENATOR A (29_) 2.2 E (2197cc) 11/1984-08/1987 Saloon/Petrol 22 E 115/85 2/4 Rear Wheel Drive. Body and Trim. Cooling and Heating. Product Type Ignition Leads Set. Ignition > Ignition Cable and Connectors. 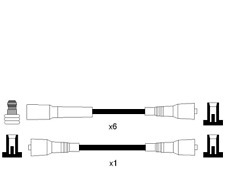 Ignition cables from Bosch. 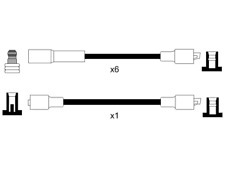 Over 220 resistive ignition cable sets. Over 110 different copper-core ignition cable sets. A significantly extended product range of accurate high-tension ignition cables. KERR NELSON: OEK101, BERU: ZEF627, BREMI: 300/382, CHAMPION: CLS218, GENERAL MOTORS: 90296017, JANMOR: ODS234, ODS238, ODU234, ODU238, MOTAQUIP: LDRL1817, OPEL: 16 12 430, 16 12 476, QUINTON HAZELL: XC589, SMPE: 73782, OEF300, OES109, VALEO: 346662. BMW 525 TDS (E34, E39) 2.5 Tds. BMW 725 TDs (E38) 2.5 Tds. BMW 318 D (E36) 1.8 TDS. BMW 325 (E36) 2.5 TDS. VE522336 Ignition Lead Set fits OPEL VAUXHALL VE522336 Ignition Lead Set fits OPEL VAUXHALL. NOTE1 : Part Number - VE522336. > Ignition Coils & Modules. > Ignition Leads. > Air Mass Sensors. The range includes.